Amylulita says...: Hawt Latina drummer! Plays Psychobilly, Punk and Metal in 5in Stilettos! Hawt Latina drummer! Plays Psychobilly, Punk and Metal in 5in Stilettos! Okay, so let's see. 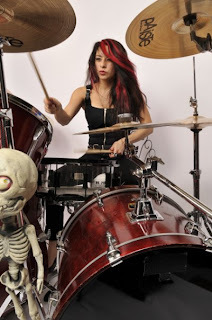 Hawt Latina who plays drums for Psychobilly, Punk, and Metal bands in 5inch stiletto heels?? Now that's my kinda chavita. Obviously drums are not meant only for guys and Lux can prove that to you in a heartbeat! Lux was born on August 12, 1985 and at the age of twelve, she was taught how to play drums at a Latin music school she and her sisters attended. They learned to play Cumbias, Rancheras, and Balladas; Latin dance music. By the age of 13, lux and her sisters were playing paid gigs at weddings and parties. For the next three years they continued to play Latin music until they were introduced to the song "Zombie" by The Cranberries... After being exposed to hard rock, there was no turning back. lux went on to teach herself to play hard rock while listening to bands such as The Cranberries, Van Halen, Megadeth, and Sonic Youth. During her sophomore year of high school, her brother brought home a Judas Priest album: Painkiller. lux was amazed at the incredible double bass speed and fast rolls, she bought a second bass drum and has been playing double bass ever since. lux has achieved major credibility in the 12 years of her drumming career. She has thousands of loyal fans and is recognized in the male dominated metal, hard rock, and indie/punk experimental scenes. Her signature drumming combines heavy metal double-bass with complex rhythms and dynamics, all while playing in stilettos and it doesn’t stop there. She also has the creative mind to incorporate elements of progressive and experimental rock rhythms. Music Connection Magazine describes her drumming as “…unique, off kilter, Keith Moon inspired drumming.” In November '07 she was awarded ‘Best Female Drummer’ in the Metal/Hard Rock category at the All Access Magazine Music Awards. In December '07 she was awarded ‘Outstanding Female Drummer of the Year’ by Rock City Magazine. This young drum goddess has opened for Third Eye Blind, Joan Jett & The Blackhearts, Reverend Horton Heat, Christian Death 1334, Chris Caffery, Doro, and Kamelot. She was on the 2006 Vans Warped Tour (which she received recognition for in the September ’06 issue of Drum! Magazine). 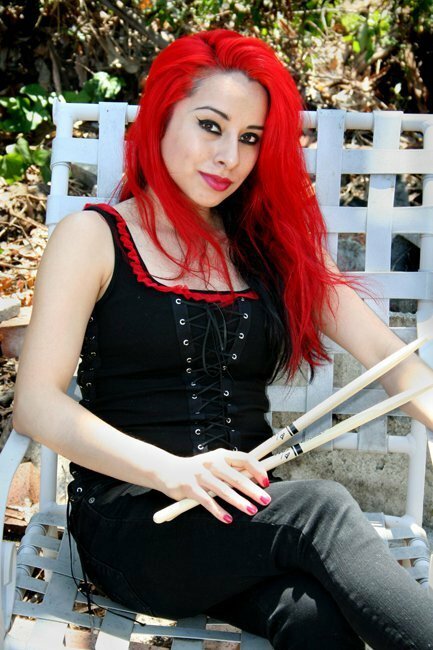 In December 2006, lux was announced as 'Miss WFD 2007' for the World's Fastest Drummer competition at the NAMM Convention where lux amazingly set the record for Single Strokes in the Female Category at 901 Strokes in 1 minute. Shortly after, she was seen once again in Drum! and Modern Drummer magazines, April & May issues, for her record. In 2008 lux was seen on television on Sí TV's Jammin battle of the bands contest where after playing live in front of music mentor Dave Navarro (Janes Addiction), he commented "...I know a lot of guys who can't play like that." The show is still being aired as re-runs on MTV and Sí TV. Lux is an official endorser of Paiste, Axis Percussion, Serial Drummer Clothing, run by drummer Franky Costanza, and has a full sponsorship with Too Fast Clothing. 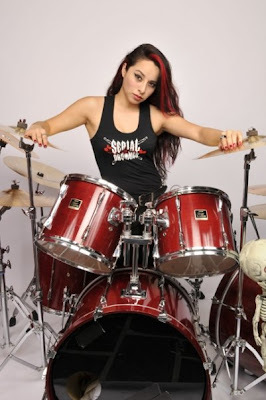 She is currently drumming for the well established psychobilly band Nekromantix and the thrash/death metal band Sacred Storm. Sacred Storm recorded a new EP titled Extreme Assault, now available on iTunes and CDBaby. Nekromantix recently returned from a nationwide tour with Rob Zombie this past Fall/Winter. The band is in the process of mixing their new album which will be released in 2010.